W4NVU – Dade Radio Club of Miami Inc.
…CQ CQ CQ Calling All Stations, Please join us for our next club meeting. There will be testing available for new licenses and upgrades. All past, present, and future amateur radio operators are welcome! Time and Location: We meet every 2nd Monday of each month at 1900 HRS, at the Miami-Dade County Emergency Operations Center at 9300 N.W. 41 Street, Doral FL. 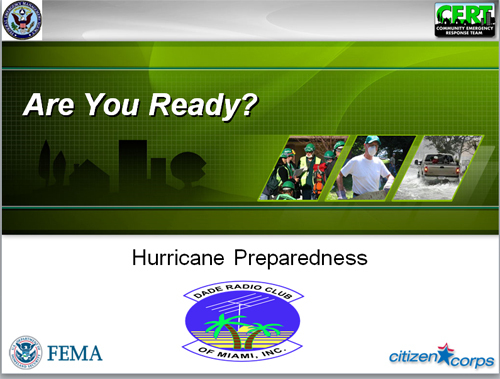 All Meetings will be located in the Miami-Dade County EOC Comm Room unless noted. Directions to meeting: Turn left at the traffic light in front of the Fire Rescue Headquarters/Miami-Dade EOC, and follow entrance road to the left, If gate is closed, please ring bell and tell the guard you are there for the Dade Radio Club meeting. Park behind the building and enter at ramp door, sign in and follow signs to ECOM room. Membership is not required to visit our meetings. You will find a membership application on the “Membership” section of our website.